MM70: Travel Grants for Students! 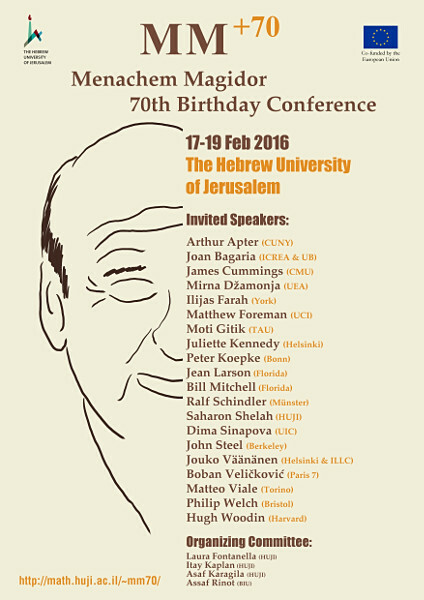 The registration to Menachem Magidor's 70th Birthday Conference is still open! I recently heard the news that Oren Kolman passed away a couple of weeks ago. After so many terrible YouTube videos about math, about four months ago Michael Stevens made a really nice video about the Banach-Tarski (Banach-T-Rex) paradox. This video was made surprisingly well by someone who has little to none formal mathematical education, but certainly the desire and [at least basic] prowess to understand that perhaps things are not as simple in mathematics - especially when infinite objects are involved - and perhaps you can't just drop something on your audience in hope they view you as a magician. Instead, Michael tried to educate the viewers, in a fairly reasonable way, about infinite objects and the preliminaries needed for the Banach-Tarski paradox. MM70: Registration is now open! I am happy to announce, on behalf of the organizing committee, that the registration for Menachem Magidor's 70th Birthday Conference is now open! What is cofinality of a[n infinite] cardinal? If we think about the cardinals as ordinals, as we should in the case the axiom of choice holds, then the cofinality of a cardinal is just the smallest cardinality of an unbounded set. It can be thought of as the least ordinal from which there is an unbounded function into our cardinal. 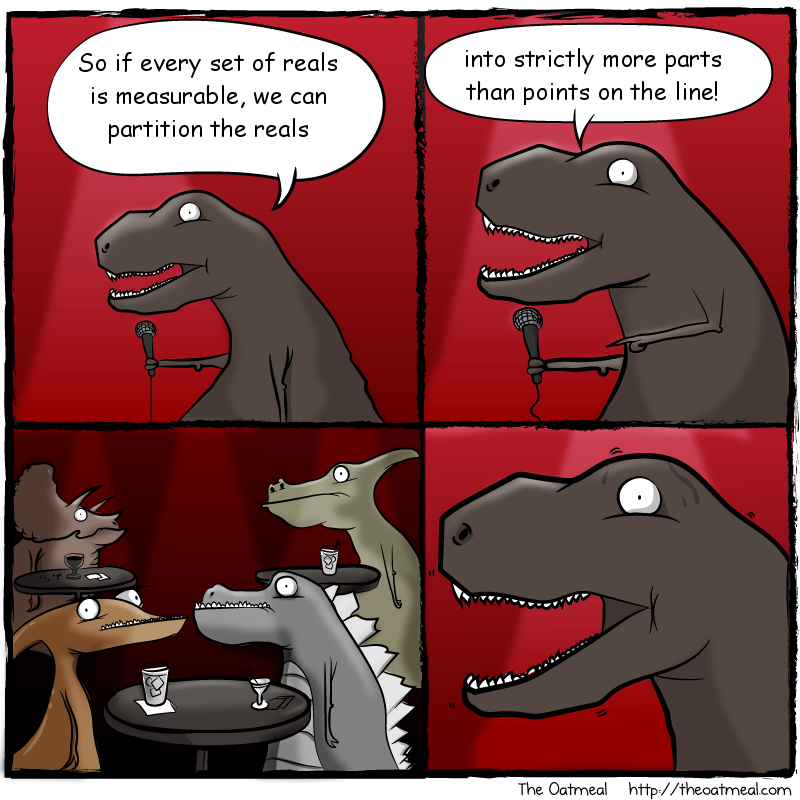 Or it could be thought as the smallest cardinality of a partition whose parts are all "small". In a recent Math.SE question about the foundations of category theory without set theory, someone made a claim that \(\ZF\) makes it hard to learn mathematics, because in \(\ZF\) the questions "is \(\RR\subseteq\pi\)?" and "is \(\RR\in\pi\)?" can be phrased. They continued to argue that there are questions like whether or not hom-sets are disjoint or not, which are hard to explain to people who are "drunk on ZF's kool-aid". How do you read a paper? Some time ago I was talking to some people about how they read a paper. And I learned that I am somewhat significantly different from a lot of people. I spent some time thinking about it, and I arrived at some interesting conclusions. I had already written about anti-anti-Banach-Tarski arguments. But now the Mathematical T-Rex has something to say too. Randall Munroe of the xkcd fame has a new book coming up where he explains various concepts using a small repository of "simple" words (this is based on this xkcd comic). He recently posted this blog post, where he reveals a word checker program that he wrote to help him with the task. In the best TV show ever produced, Patrick McGoohan plays the mysterious No. Six. He lives in The Village, where former spies are held. The people there are essentially captive, and they all have numbers instead of names. But he is not a number! He is a free man! Anyone who peruses mathematical Q&A sites, or had students come to office hours or send questions via other means (email, designated forums, carrier pigeons, or written on a note tied to a brick tossed into your office) knows the following statement: "I don't know where to begin", or at least one of its variants. Richard Feynman, who was this awesome guy who did a lot of cool things (and also some physics (but I won't hold it against him today)), has a famous three-steps algorithm for solving any problem. Ever explained to a "working mathematician" about the undecidability of the continuum hypothesis? I bet you too had felt like this T-Rex. Is the Continuum Hypothesis a definite problem? I am not a Platonist. I don't like social media very much. I never really subscribed to the whole Friendster, MySpace, Facebook, Twitter, Google Wave, Google+, and what have you social network sort of approach that you need to have "friends" and "followers" and "follow" other people. Have you heard? Young Set Theory 2015 will take place in Jerusalem! How exciting is that? Tomorrow (Monday, July 20th) is the last day for registration. This means that you have only a few hours to get yourself together and send an application! Here are the rules of research. Feel free to add your own. If it seems obvious, it's probably false as stated. If it seems obvious and true, it's probably false without additional hypotheses. If you think that you wrote a proof, you probably missed something obvious. See (1) and/or (2). You missed something obvious, see (1). When you go to see your advisor, suddenly all your thoughts align, and you find the solution. Two hours after finally talking with your advisor, you realize that your solution is obvious, therefore (1) or (2) apply. If you use forcing to prove the argument, then you probably missed some object being encoded generically. If you use forcing, and you didn't miss some crucial object, then you missed some other crucial object not being coded by the generic. It's not false if you can force it. It's not true if you used the axiom of choice more than three times in the proof. It's not cheating if you asked a visitor to the university whose visit did not span longer than two weeks from the moment you asked them. If your question was about inner models, you may extend the above timespan to a month. Equally, if the question is about the axiom of choice, it should be shortened to a week. It's not considered unethical to make sacrifice in order to appease Mayan and Aztec gods. Just in case we got it wrong, and they're in charge of the mathematical universe. If it still seems obvious, you're probably right. It's still false, though. If you need six technical lemmas, whose proof is reduced to a single line (or just one lemma with an actual proof), then it's probably obvious. Unfortunately, see (1) and (2). If by some chance something is obvious, but you wrote out the proof, and it checks out, then it wasn't obvious at all. Remember what the dormouse said: feed your head. If you haven't watched Futurama in a while, then you're doing something wrong. Whatever happens, it's the other guy's fault. Also, see (1). I just work here, you know? I don't. Rolling a D20 die to determine the truth value of a statement is the original algorithm behind proof verification software. When you hit the wall, and you're about to give up and decide that whatever you're trying to prove is false, see (4). The only proofs that write themselves are obvious proofs. If your proof is obvious, see (2) and (3). To be honest, it needs more cowbell. Seriously, you're gonna want that cowbell in your proof. See (1), (2) and (4). When assuming the axiom of choice the product topology and box the topology are quite different when considering infinite products. For example the Tychonoff product of countably many sets of three elements is compact, metrizable an all in all a very nice space. On the other hand, the box product is not separable or second countable at all. The account has been suspended, I'd like to thank everyone who helped! I have removed the comments posted by "Isa Bria" after the real Isa Bria has contacted me and asked to remove them. So closing in on my third year, and in theory I should finish my dissertation by next summer. This means that I should probably start the writing process around April (I'm a fast writer, what with having a quality keyboard and knowing LaTeX quite well). In a manner more befitting to Edgar Allan Poe, Mathematics is a cruel and unforgiving mistress. Last night I posted a strange story about a gecko and a moth. Spring has begun in Israel. One of the reasons I love set theory so much, and specifically choice related research, is that this is an extremely fertile ground for amusing terminology. We have forcing, cardinals, collapsing, we have all sort of gems and rodents at our disposal... we even have a swamp thing.